Tá foireann Leabharlann Chiarraí breá sásta comhairle a thabhairt duit ar ceisteanna faoi stair áitiúil Chiarraí, ach níl an fhoireann in ann taighde a dhéanamh ar son daoine. Poor Law Boards of Guardians Minute Books for all of the Kerry Unions. Grand Jury Presentments, 1874-89 & 1892-97. Kerry County Council Rate Books & Abstracts of Accounts. Kerry County Board of Health Minutes (1922-42), Correspondence (1922-45) and Collection Books (1939-69). County Infirmary Minutes 1812-1913. Kerry County Committee of Agriculture Minutes, 1920-1988. Tralee & Killarney UDC Financial Volumes. North Kerry Archaeological Survey Maps & Related Fieldwork Notes. Ordnance Survey, 1841 (1st edition). Geological Survey of Ireland – Kerry Maps. Maritime Maps, 1775 (Dursey to Valentia Island ) and 1860’s. O’Brien Corkery & Company, Kenmare 1850-1952. Lord Listowel Estate Rentals (1880s-1960s), Deeds (1812-1956) & Legal Proceedings Papers (1877-1970). James D Crosbie, Land Agent, 1892-1909. Gun Estate Rental (1879) and Legal Papers (1890-1949). Baron Ventry Estate Fair Rent Agreements (1906) & Legal Papers (1891-1920). Chute Family Papers & Deeds, 1823-1940. County Surveyor ’s Reports 1899-1918. Robert McClure, Glenhazel, Land Agent, 1860s-1920s. Theo Stoakley Local History Collection. Reidy Literary and Family Papers. Creagh & Byrne (Matthew Byrne & Co.) Papers. O’Keeffe, McGillicuddy, Foley, Flahive, Leonard, Kearney, Keane and Gentleman families. 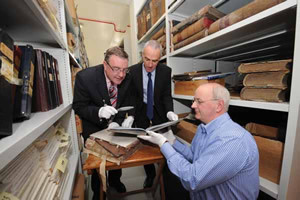 The National Archives’ Business Records Survey has also produced some donations to the collections in the County Archives . Roche’s of Castleisland (1902-06 & 1922-24), Robert McCowen & Sons Ltd. (1913-1922),O’Neill’s Store, Main Street , Cahirciveen, and Lynn & Knightly Outfitters.